For the ocean, the June global sea surface temperature was 0.64°C (1.15°F) above the 20th century average of 16.4°C (61.5°F), the highest for June on record and the highest departure from average for any month. Yikes, it sounds as though it’s a manmade global warming problem. But we know that’s not true because climate models doubled the warming rate of global sea surface temperatures for the past 3+ decades. So even record highs are much better than the temperatures anticipated by the latest and greatest climate models. As an advanced warning, NOAA will be making a similar statement for July 2014. See the graphs to the right. (Click for full size.) The red horizontal lines are the July 2014 values. NOAA bases their discussions on the ERSST.v3b-based data (bottom graph). The satellite-enhanced Reynolds OI.v2 dataset (top graph) serves as a reference. Yup, it’s true. 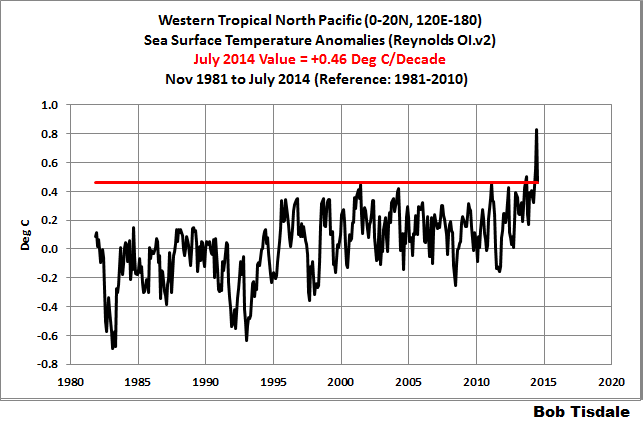 July 2014 global sea surface temperatures are the warmest on record, too. In this post, we’ll present which ocean basin is showing the elevated sea surface temperature anomalies, and where they’re showing it, and provide what will likely be eventually reported as the reasons for those warm temperatures: strong trade winds and persistent high sea level pressures over eastern Siberia and Alaska. Figure 2 presents the monthly global sea surface temperature anomalies for the period of November 1981 to July 2014. The top graph shows the NOAA Reynolds OI.v2 data, which, as noted above, is a satellite-enhanced dataset. 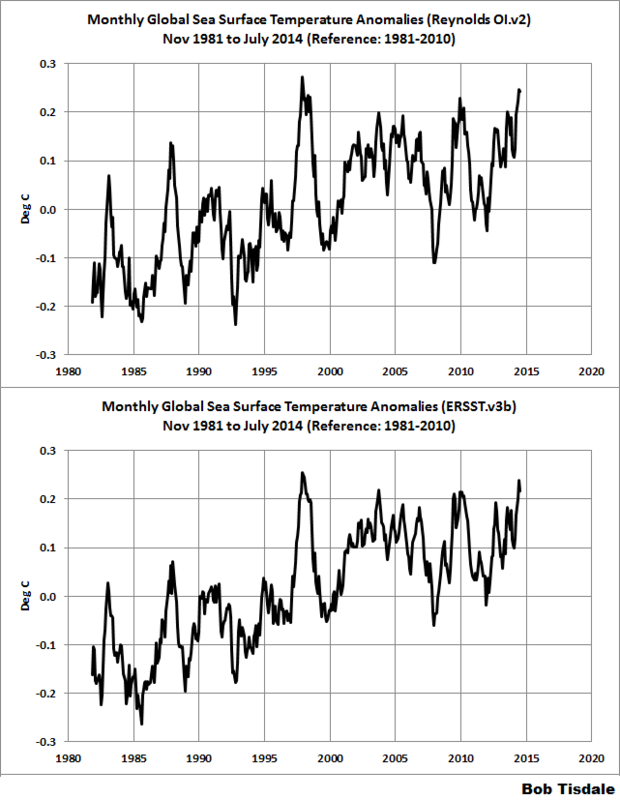 The bottom graph is the NOAA ERSST.v3b data, which NOAA uses in its global land+ocean temperature dataset. ERSST.v3b is a statistically infilled sea surface temperature dataset. Anomalies are referenced to the WMO-preferred period of 1981-2010. The Reynolds OI.v2 and ERSST.v3b data are showing close to all-time-high values recently. Before we move on to illustrating where and why the sea surface temperatures are elevated, there are a few things to discuss. It must be kept in mind throughout this post that the climate models used by the IPCC for their 5th Assessment Report basically doubled the observed warming rate of the surfaces of the global oceans. Doubled. In other words, the model mean represents the central tendency of how the climate science community thinks the oceans should have warmed if they were warmed by manmade greenhouse gases, and, in the real world, the oceans only warmed at half that rate for the past 32+ years. Or to phrase it a little differently, in the models, the warming of the surface of the oceans is forced by manmade greenhouse gases, but in the real world, the ocean surfaces are obviously not as sensitive to manmade greenhouse gases as the climate science community assumes. Now consider that the data existed before the climate simulations were run. 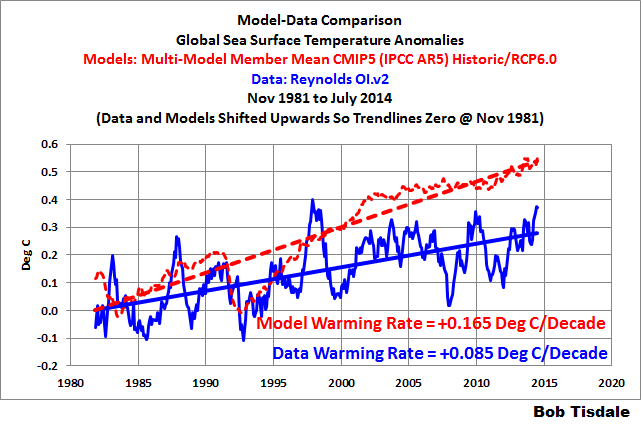 So modelers knew in advance the warming rate of the ocean surfaces for the most of that period. That is, most of simulations from 1981 to present are hindcasts, not forecasts. The modelers knew the answers they were looking for, and somehow doubling the observed warming rate of the surfaces of the global oceans (70% of Earth’s surface) over the past 32 years was the best the modelers could do. That’s climate science in a nutshell. If you were to scroll through all the ocean basins presented in the July sea surface temperature update, you’d find that only the North Pacific has shown exceptional warming over the past year or so. But that one ocean basin has had a major impact on sea surface temperatures for the entire Pacific basin and the Northern Hemisphere, both of which are showing record highs recently. In turn, global sea surface temperatures are at record highs. 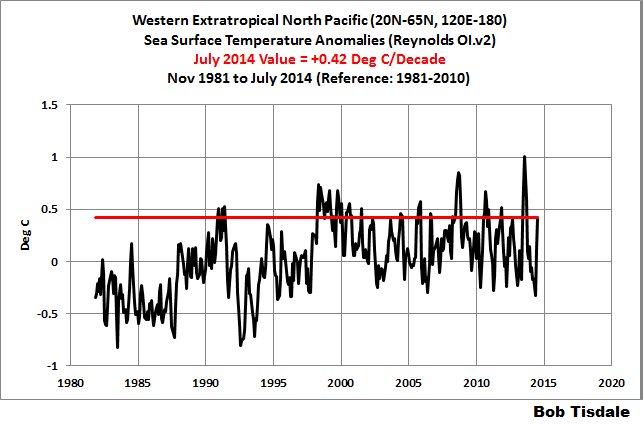 The North Pacific sea surface temperature anomalies during the satellite era, along with the July 2014 value, are shown in Figure 4. According to the NOAA webpage here, the North Pacific covers about 21% of the surface of the global oceans, or about 77 million sq. km. To put that into perspective, the North Pacific covers almost as much of the globe as Asia, Europe and North America combined (78.5 million sq. km. ), so the North Pacific is a chunk of real estate. 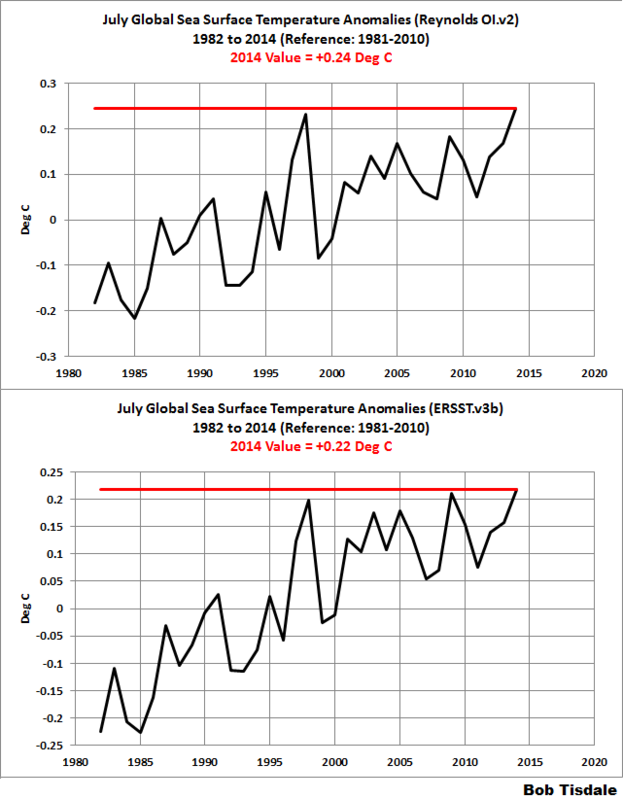 Notice in Figure 4 how unusual that warming in 2013 and 2014 appears. To illustrate how unusual that recent warming is, I determine how far back in time from December 2012 we could go without showing any appreciable warming in the sea surface temperature data of the North Pacific. See Figure 5. 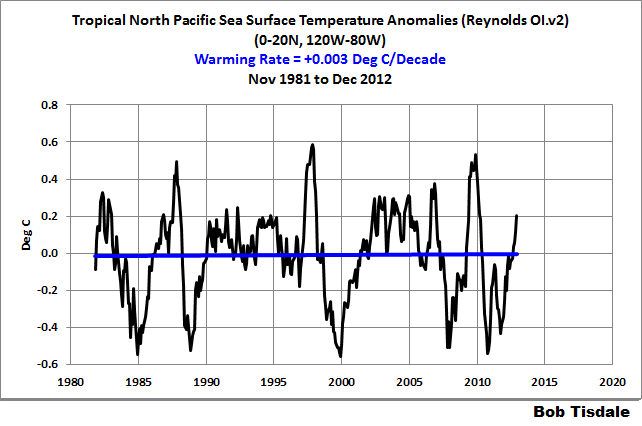 The sea surface temperature anomalies of the North Pacific showed basically no warming from January 1989 to December 2012. That 2 ½ decade lack of warming is quite remarkable in a world where greenhouse gases are supposed to be warming the surfaces of the oceans. To help present where the North Pacific has warmed, we’ll divide its data into four subsets, separating the tropics from the extratropics and dividing the data east and west at the dateline. See the map in Figure 6. The map also presents the sea surface temperature anomalies for the year of August 2013 to July 2014, referenced to the period of 1981 to 2010. Of the four regions, the eastern extratropical Pacific had the highest anomalies, while the eastern tropical Pacific had the lowest. The two western regions both show elevated sea surface temperatures over the past year, but a region of cooler-than-normal sea surfaces offsets some of the warmth in the western extratropics of the North Pacific. Figure 7 presents the sea surface temperature anomalies during the satellite era for the eastern tropical North Pacific (0-20N, 180-80W). Also shown is the cooling rate. 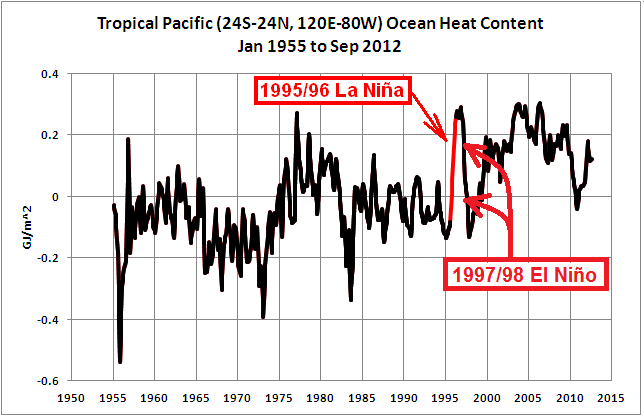 The cooling of course was caused by a shift from El Niño dominance to La Niña dominance. The warming in recent months is higher than we’d expect from the weak off-season El Niño conditions we’ve recently experienced. We’re discussing the northwest subset of the North Pacific under this heading. 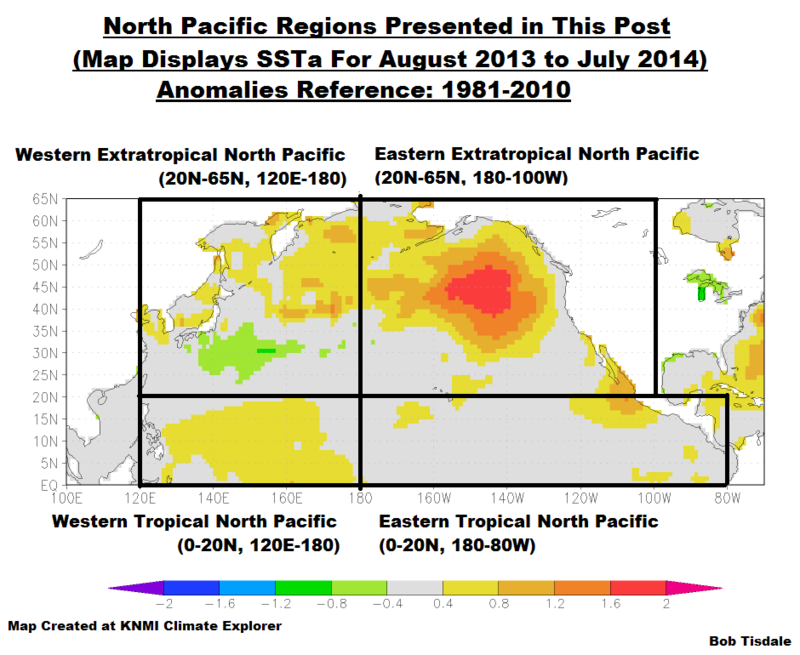 As shown in Figure 8, the sea surfaces of the western extratropical North Pacific (20N-65N, 120E-180) were above average in July 2014, but not exceptionally warm. There was also a spike a year ago, peaking in August 2013. Will that spike repeat itself this year? There are very obvious upward shifts in the sea surface temperature anomalies of the western extratropical North Pacific. In Figure 9, I’ve highlighted in red the periods before and after the step-like responses to the 1986/87/88 and 1997/98 El Niño events. Leftover warm water from strong El Niño events (ENSO residuals) make their way into the western extratropical North Pacific during the La Niñas that trail the strong El Niños. For more than 5 years, we’ve discussed the processes through which strong El Niño events cause upward shifts in surface temperatures of portions of the global oceans. My illustrated essay The “Manmade Global Warming Challenge” (42mb) provides a detailed overview, if that topic is new to you. Also notice that the surfaces of the western extratropical North Pacific have been cooling since the upward shift in response to the 1997/98 El Niño…even with the spike 2013. 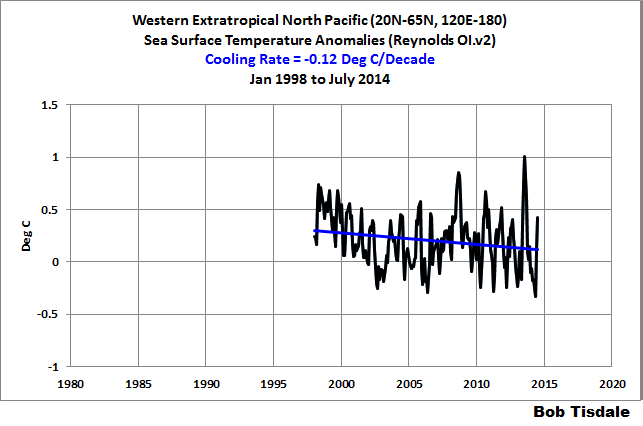 Figure 10 confirms that the sea surfaces in the western extratropical North Pacific have cooled since 1998. Now we’ve moved to the western tropical North Pacific (0-20N, 120E-180), Figure 11. 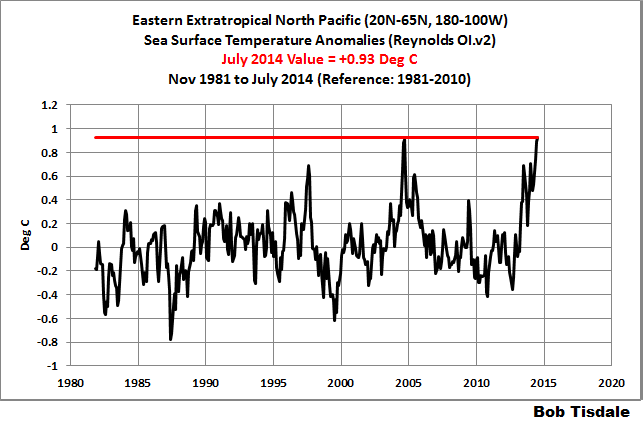 Sea surfaces there were much warmer than normal in July 2014 (the red horizontal line), and that’s even after cooling significantly since their peak a month ago in June. 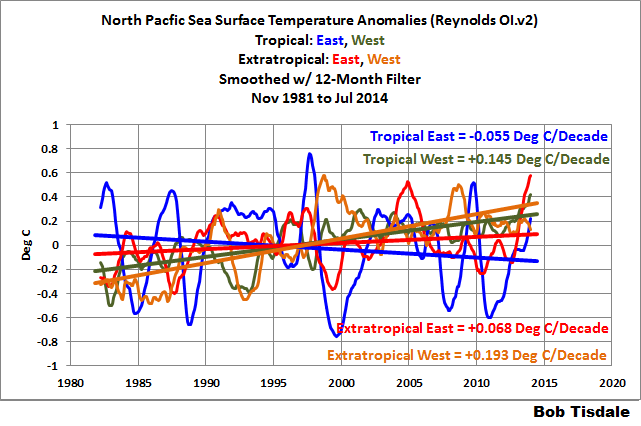 There is also an obvious upward shift in the sea surface temperature anomalies of the western tropical North Pacific. That shift occurred in response to the 1995/96 La Niña. See Figure 12. That’s the same La Niña that caused the upward shift in the ocean heat content of the entire tropical Pacific. 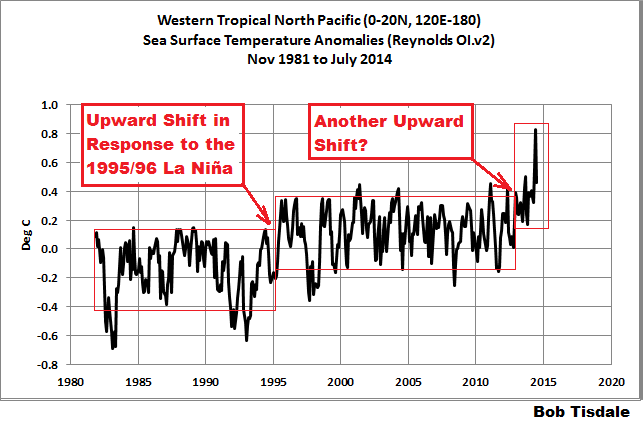 Was there another upward shift in the surface temperatures of the western tropical Pacific in 2013? The last of the regions of the North Pacific, the northeastern one, is where that hotspot resides. The sea surface temperature anomalies of the eastern extratropical North Pacific are shown in Figure 13, with the horizontal red line showing the magnitude of the July 2014 value. It is slightly higher than the June 2014 and August 2004 values. But notice that the surfaces of the eastern extratropical North Pacific cooled from the late 1980s until 2012…and then appear to shift upwards. See Figure 14. 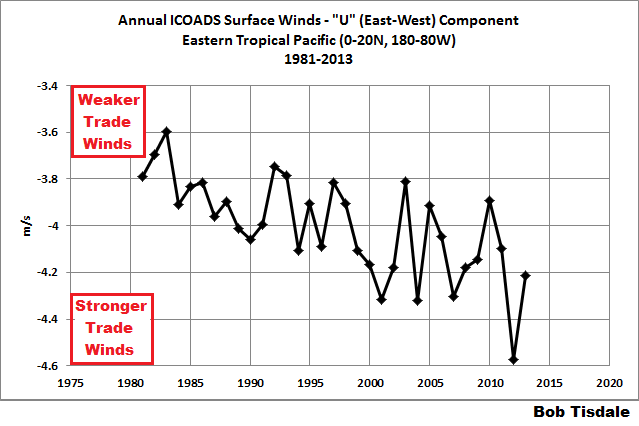 Figure 15 confirms that the sea surfaces of the eastern extratropical North Pacific cooled from the January 1989 until December 2012, and Figure 16 shows that the sea surfaces there show no long-term warming since January 1989, even with apparent upward shift in 2013. The apparent late 1980s upward shift in the sea surface temperatures of the extratropical North Pacific was discussed in Trenberth and Hurrell (1995) Decadal coupled atmosphere-ocean variations in the North Pacific Ocean. 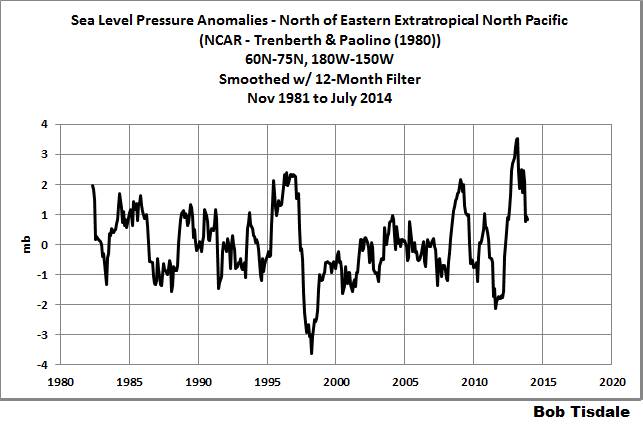 They identified two culprits: a shift in sea level pressure (which alters wind patterns) and the 1986/87/88 El Niño. When the climate science community finally delves into the causes for the elevated sea surface temperatures of the North Pacific, I suspect they’ll present at least two natural causes that have interacted and compounded one another. The shift in surface temperatures in the western tropical Pacific is possibly a response to the sudden strengthening of the trade winds in the eastern tropical Pacific in 2012. See Figure 17. The stronger trade winds, under clearer skies, pushed additional sunlight-warmed water into the western tropical Pacific. And, of course, there has been a persistent high sea level pressure (north of the eastern extratropical North Pacific) in the Eastern Siberian Peninsula and Alaska, according to the NCAR sea level pressure data, Figure 18. At the KNMI Climate Explorer the dataset is identified as “1899-now: Trenberth’s NH”. The coordinates used for the sea level pressure were 60N-75N, 180-150W. 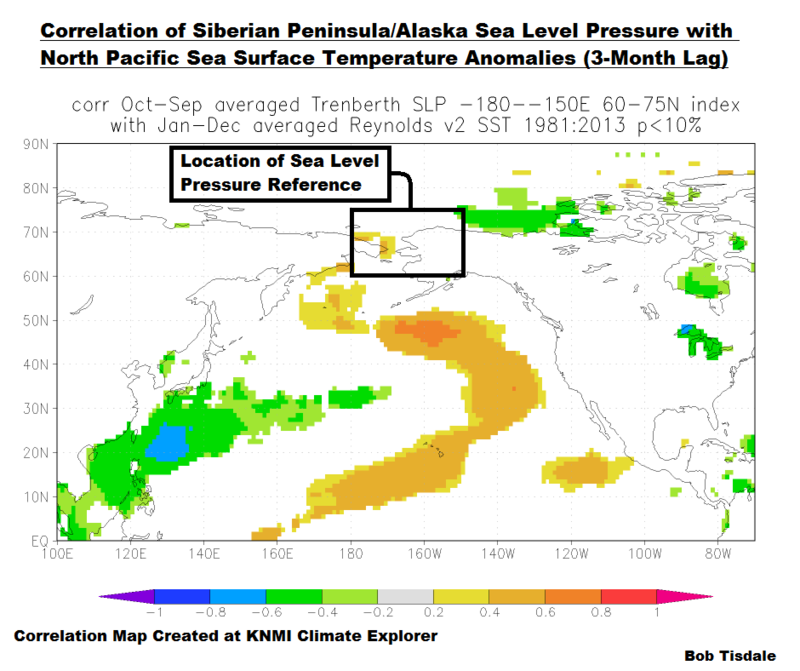 Figure 19 presents a correlation map of the Eastern Siberian Peninsula and Alaska sea level pressures (highlighted on the map) with the sea surface temperatures of the North Pacific, where the sea surface temperature data lag the sea level pressure data by 3 months. So I suspect that hotspot in the North Pacific will be blamed on the sea level pressures in Eastern Siberia and Alaska. For those interested, the spaghetti graph in Figure 20 compares the warming and cooling rates of the four North Pacific sea surface temperature subsets during the satellite era. I’ve isolated the individual subsets in Animation 1. As you may have noticed, I discussed the warming of the sea surface temperatures of the North Pacific, and the extratropical North Pacific, without once mentioning the Pacific Decadal Oscillation. The JISAO Pacific Decadal Oscillation Index is derived from the sea surface temperatures of the extratropical North Pacific but the PDO Index does not represent the sea surface temperatures of that region. The PDO Index cannot be used to explain the warming of the North Pacific sea surfaces…or global surfaces for that matter. For more on what the PDO does and does not represent, see the post here. 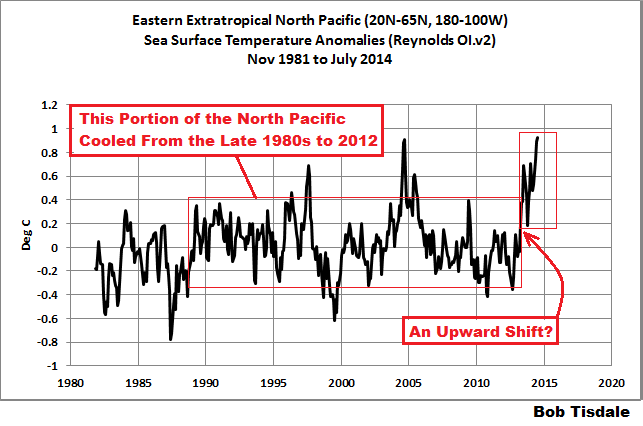 HAS THERE BEEN A CLIMATE SHIFT IN THE PACIFIC? The 1976 Pacific climate shift preceded a period of strong El Niño events. See Figure 21. In 1976, the sea surface temperatures of the eastern Pacific ocean (about 33% of the surface of the global oceans) shifted upwards by almost 0.25 deg C, according to the NOAA ERSST.v3b dataset. The shift is actually easiest to see with the levels the minimums reached during the La Niña events before and after 1976. I’ve noted the possible recent shift in a number of graphs in this post. The recent shift also makes its presence known in the sea surface temperature data for the entire tropical Pacific (0-20N, 120E-80W), not just the western portion. Figure 22 shows the satellite-era data for that region until December 2012. Everything looks reasonable. 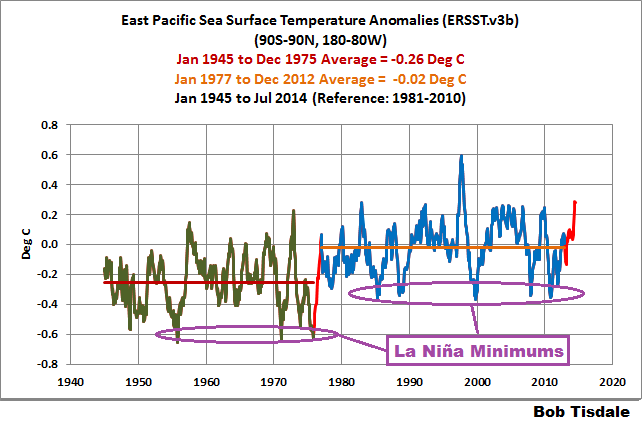 The El Niño and La Niña events are easy to pick out and there has been no long-term warming. 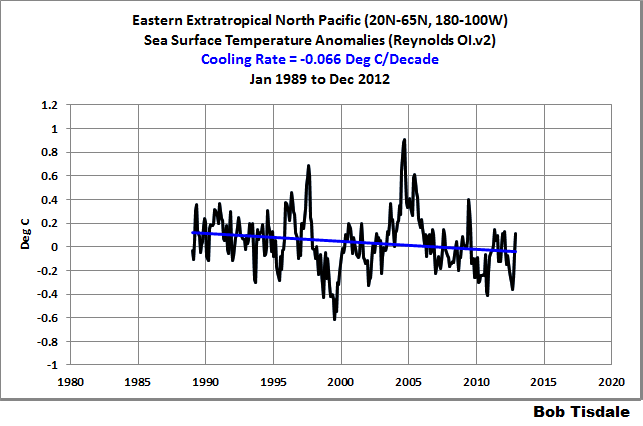 Now, when we add the 2013 and 2014 data to the graph, Figure 23, it looks like there’s a super El Niño taking place now. HOW LONG WILL THE HOTSPOT EXIST IN THE EASTERN EXTRATROPICAL NORTH PACIFIC AND WHERE WILL THE WARM WATER GO? The greatest warming over the past year took place in the eastern extratropical North Pacific. That hotspot in the sea surface temperature anomaly map (Figure 6) stands out. It’s hard to miss. The question now is how long will it persist? And will the hotspot reemerge again next year? “Reemergence” is a process that causes sea surface temperature anomalies at mid-latitudes from one year to reemerge the next year. See the post here. In the North Pacific, reemergence is believed to occur west of the hotspot in the western extratropical North Pacific. But that hotspot in the eastern extratropical North Pacific is a rarity. So reemergence might be something else to consider. Ocean currents should eventually carry part of that warm water back to the tropics, warming the California current along the way. 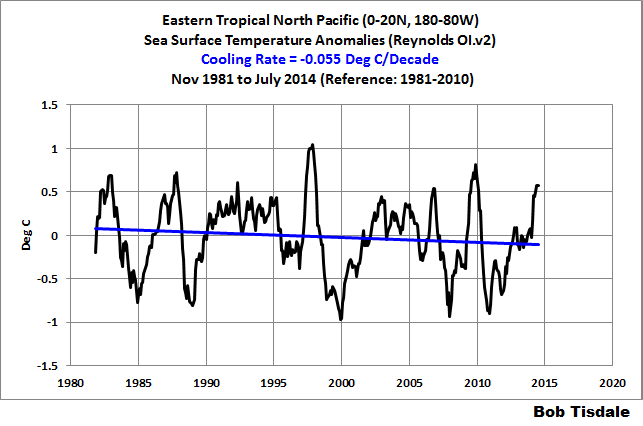 Will that warm water influence ENSO when it reaches the tropics? 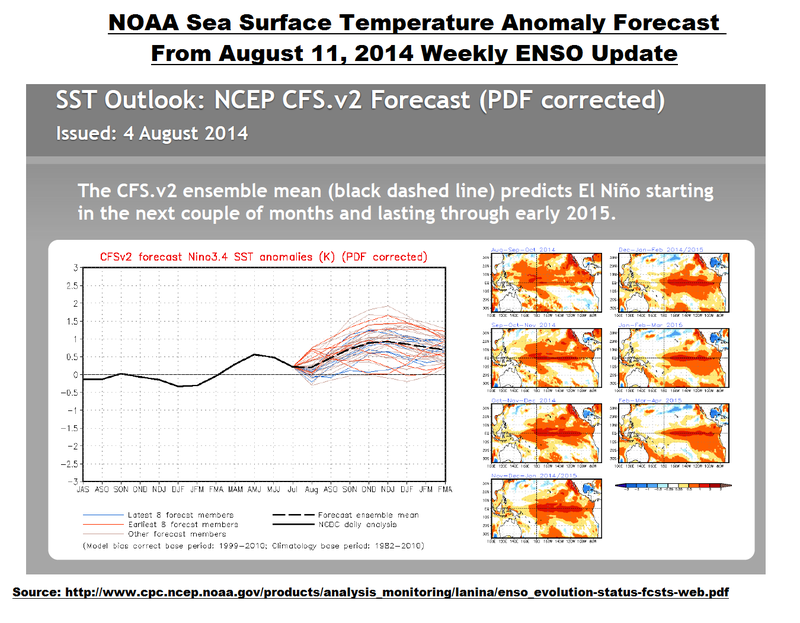 My Figure 24 is page 26 from the NOAA weekly ENSO update for August 11, 2014. (Click on it for full-sized illustration.) The hotspot can be seen at the top of the Aug-Sep-Oct map, but it disappears by Oct-Nov-Dec, and by next year, they’re showing cooling where the hotspot now resides. I’ve shown throughout this post that the sea surface temperatures of the North Pacific warm in shifts, the results of naturally occurring processes: ENSO and variations in sea level pressure. Not too surprisingly, those are processes climate models still cannot simulate to this day. Climate models will one day be a valuable resource, but we’ll have to wait until modelers can simulate naturally occurring, sunlight-fueled, coupled ocean-atmosphere processes that can cause warming of sea surfaces and the oceans to depth. We may be in for a long wait. With the unusual warming events taking place recently in the North Pacific, global sea surface temperatures are at record high levels. Alarmists will attempt to use that to advance a political agenda. Unfortunately for those trying to advance those policies, climate models serve as the only support for human-induced global warming. Their not-very-illustrious climate models cannot explain why sea surface temperatures of the North Pacific have warmed at a much lower rate than anticipated during the satellite era, and the models cannot explain why the surfaces of the North Pacific stopped warming for almost ¼ of a century. See Animation 2. That, of course, will not stop alarmists from making all sorts of nonsensical claims about the recent sea surface warming, and the mainstream media will join them on the bandwagon. The data, climate model outputs and the maps presented in this post are available from the KNMI Climate Explorer. 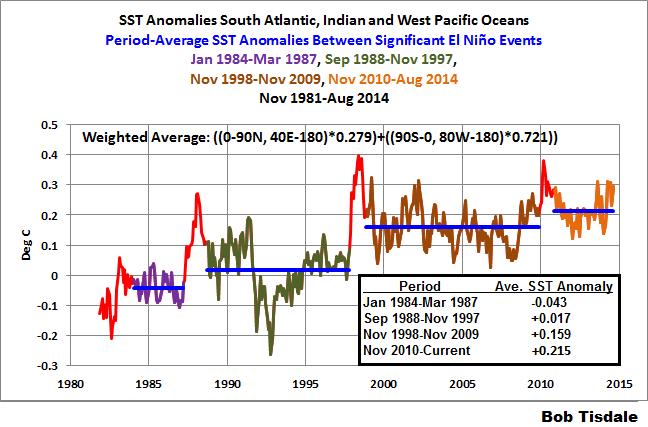 This entry was posted in Alarmism, El Nino-La Nina Processes, SST Dataset Info, SST Update, The Blob. Bookmark the permalink. Thanks, Bob. Very instructive post. 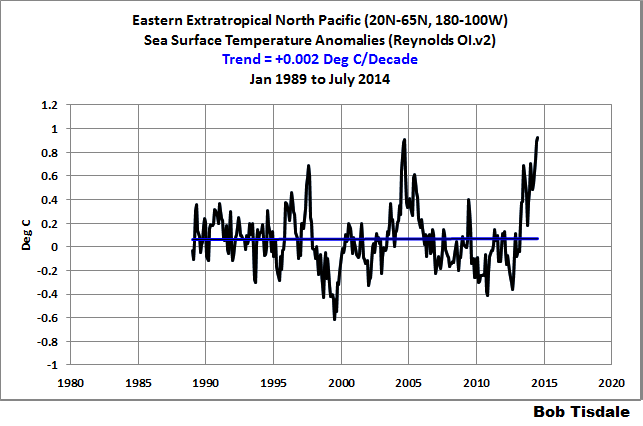 BOB TISDALE… has dissected this recent record high Global sea surface temperatures for JUNE 2014. He has used used lots of graphs to show you how each of the major basins have performed. Looking at this from a holistic viewpoint, if we have a lack of tropical activity as we have had, relatively speaking, for the past few years, I would expect to see the waters of the northern Pacific warm up. This is because less heat is being pulled out of the water by these storms and dumped to atmosphere and the ocean is transporting the heat poleward. I would be curious to see if the result of less tropical ACE in the Pacific in summer results in stormier conditions in winter in the northern Pacific the following year as we have warmer water interacting with polar air in winter. Another thing I have noticed during this protracted “La Nada” is that the Pacific has seen a persistent meridional jet stream flow, particularly in winter which has manifested as the current drought in California. The “Pineapple express” jet from around Hawaii has been heading up to Alaska / British Columbia rather than a more zonal flow into the NW US as it normally does. This has been bringing warm wet storms into the area around Anchorage. So over the past couple of years we seem to have a combination of two things working here. We have a lack of tropical storm activity pulling heat out of the sub-tropical Pacific allowing currents to transport more of that heat to the extra-tropics and we have a meridional flow in winter where more heat is being transported by the atmosphere up into the Gulf of Alaska. In a more normal year, storms would come out of the Gulf of Alaska and make landfall from about Monterey Bay north to Seattle. The past year or so they have been directed into Alaska and British Columbia and the “back” side of that meridional flow pulling cold air down out of northwestern Canada into the midwestern US resulting in very cold weather there all the day down to places such as Atlanta. It is as if we see a switch from atmospheric transport of heat out of the tropics in summer to ocean transport and then the atmosphere takes that heat farther to the polls in winter than it otherwise would. Sure pretend all you want that the world isn’t warming due to greenhouse gases. If you think this current record high SST level will be unique you will be much surprised in coming years as it is surpassed again and again. The world’s scientists who understand the greenhouse effect won’t be surprised. Sounds like you’ve got information about the future, markus. Do you have a crystal ball? PS: I presented data in the post, markus. There was nothing wrong with my presentation. You presented speculation. And there’s everything wrong with your conjecture. Your quadrant map and the timing of the northern pacific warming lead me to wonder how the large scale radioactive releases and associated decay heat from Fukushima beginning in 2011 and continuing almost up until the present time, have contributed to this unusual warming pattern. Here is a personal and regional take on that warm area. The warm area of the NE Pacific is 1,100 miles, roughly, to my west. I opened the wind map at “earth nullschool net” and the CPC’s outlook maps. The current winds are interesting with stacked highs out there and southerly flow between there and the Washington coast. The CPC says above average temps and below average precip for the next few months. Seems we are in for a spell of warm days and clear nights while the coastal lowlands get a little marine layer pushing in. With the shortening day length and clear skies we are getting cool early morning temperatures – good for developing color of apples. No frost. Good for tomatoes and winter squash. The weather and ocean patterns have given Washington higher than average salmon numbers and, just now underway, a record apple harvest. What’s not to like? Mr. Tisdale — I want to express my appreciation for the tremendous effort and scholarship you invest in this passion of yours. I am about as “convicted” a warmist as can be, and while you might think I had been dropped on my head while young, and vise versa, your studies of the oceans are just terrific. They are lucid and richly instructive. I passed along your 9/7 post on El Nino to Real Climate this am. By the way, all I need to throw in with markus (8/8/14) above, is two thoughts. Chindia built 25 million cars last year. A CO2 molecule has a dipole, part of the time. We no more think it requires a crystal ball to deduce his inference, than to “conjecture” that a brick tossed into the air will fall. 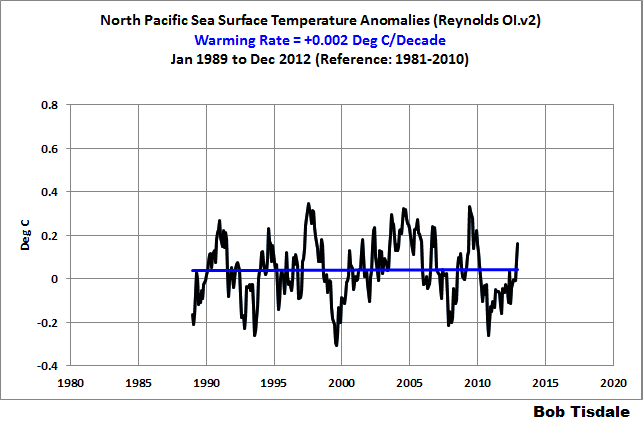 Dave Peters, thanks for the link at RealClimate. The difference between me and a typical protagonist of AGW is that I try to understand the AGW protagonist’s arguments, but the typical AGW protagonist makes no effort (none) to understand my arguments. Bob, thanks for your post. I have a question. In the paragraph about figure 8, you mentioned that el ninos cause a step-change in temperature. I’ve noticed you say that on several other occasions as well. Are implying that is only for certain el ninos or that it’s a characteristic of all el ninos? If it’s the latter, would that not imply that the same also occurred with previous el ninos. That doesn’t make sense as it implies an ever increasing temperature in the future and going backward, implies that it was cooler prior to every previous el nino. Would you please clarify your point? Bob, thank you for your reply and for the links in particular. I downloaded the pdf and will read it. Is there an inverse to the process where strong el ninos cause this step-change upwards that allows the temperature to come back down? I would think there must be otherwise it would not be sustainable. Daryl M, I have yet to see evidence of a reverse process. Bob T, regarding Daryl M’s ? True in the 30 or so years of graphic, we do not see evidence of the reverse. Yet how then do you counter Trenbeths’s (spell check) contention that the warming is one way up? Is it reasonable to speculate that we have thirty more years to see if the process steps down? Is it reasonable to notice that, as the atmosphere cools by moving air to the poles, so the oceans might do the same over longer time periods? At any rate even the step increases in SST and OHC are well below the climate model projections. David A, I know of no part of the ENSO process that would provide downward steps. An absence of strong El Ninos for a couple of decades would allow the East Indian and West Pacific to cool, but I can’t see how there could be downward steps. Thanks Bob. Perhaps the pumping of consolidated energy, an El Nino warm water pulse, must dissipate slowly, as even a La Nina is still bringing relatively warmer waters to higher latitudes. Pingback: On The Recent Unisys Sea Surface Temperature Anomaly Maps and Cooling of Northern Hemisphere Ocean Surfaces | Watts Up With That? 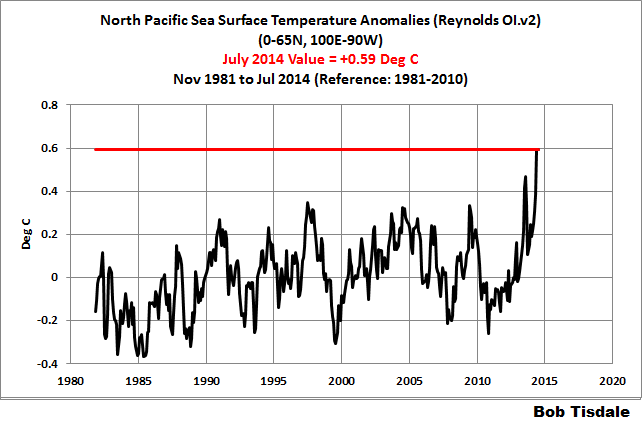 Pingback: Sorry to Disappoint: Cooling in the North Pacific? Not So Much | Watts Up With That?